The Koelle lab is interested in the molecular mechanisms by which neurons respond to neurotransmitters, and also how neurotransmission is used to control the dynamic activities of neural circuits. The human brain has ~80,000,000,000 neurons; but underlying all this complexity there are simpler units called neural circuits, small sets of neurons which are physically connected at synaptic junctions. 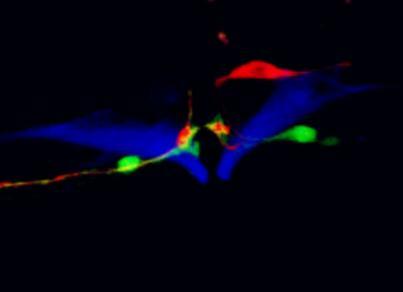 These neurons communicate with each other using chemical signals called neurotransmitters and neuropeptides, and induce dynamic patterns of circuit activity. In this way, neural circuits are the functional units of the brain, and the circuit activity induced by neurotransmitter and neuropeptide signaling is what constitutes thoughts and controls behaviors. Some neurotransmitters act by binding ion channel receptors, but these neurotransmitters also have G protein coupled receptors (GPCRs), and many neurotransmitters and essentially all neuropeptides act exclusively via GPCRs. Our lab uses a combination of C. elegans genetics along with biochemical experiments carried out in both C. elegans and mouse brain lysates to study the proteins that mediate GPCR signaling in neurons. A current focus is to identify the effector proteins that mediate signaling downstream of the major neural G protein, Gαo, to inhibit neural function. These effectors have remained elusive despite 35 years of effort by many labs to find them. Through a combination of biochemical and genetic efforts, we are characterizing a set of proteins through which Gαo signals. Why are there so many neurotransmitters and neuropeptides, and why does each neurotransmitter have so many different receptors? How is all this signaling used to set up the dynamic pattern of activity within neural circuits to allow these circuits to think thoughts and control behaviors? Currently, there is not a single neural circuit in any organism in which we know how all the signals and receptors are used to control activity of the circuit. We aim to change this by studying a single simple model circuit in C. elegans, the egg-laying circuit. We are also generating a map of what cells express every G protein coupled neurotransmitter and neuropeptide receptor in C. elegans, so that our analysis of the egg-laying circuit can eventually be broadened to analyzing all neural circuits in C. elegans. By understanding first one and then a few neural circuits in great depth, we hope to uncover general principals that apply to all neural circuits in all organisms. Click on the links at the top right to learn specific details about individual projects in the lab. Welcome to the Koelle Lab!